The 1616M sets a new benchmark for mobile audio interfaces. It'll take some beating. Astounding sound quality. Oodles of connections. Great preamps. Ethernet-cable compatible. Incredibly versatile. Excellent value. 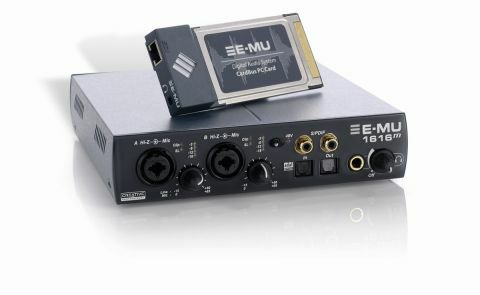 Let's make one thing clear right from the start: the E-MU 1616M is far more than 'just another quality interface'. The package includes a CardBus card and the sturdy MicroDock M (not to be confused with the conventional MicroDock) breakout box. The card has two connectors - an 1/8" headphone/line-out jack and an E-MU EDI interface (which houses an Ethernet-type port) for connection to the MicroDock M. This means you can use relatively cheap Ethernet cables to place the box wherever you like. On the front panel of the MicroDock are two E-MU XTC Hi-Z Neutrik preamp inputs with phantom power and analogue soft limiting. These accept two balanced line, guitar or microphone signals. Just below are the gain pots - which can give a whopping 60dB of boost - and above are level meters and separate LED indicators for clipping and soft-limiting. Next come the digital S/PDIF phono in/outs (switchable to AES/EBU) and ADAT optical connections (offering eight additional digital ins and outs). Finally, there's a 1/4" headphone jack. Around the back of the MicroDock M are two more sets of balanced 1/4" jack inputs, each of which boasts an impressive 120dB signal-to-noise ratio. Also onboard is an RIAA stereo turntable input and ground connector (deactivated when jacks are inserted into the second pair of inputs), and then there's a MIDI breakout cable port that gives 32 channels of MIDI I/O over standard MIDI connectors. Below these are three stereo pairs of outputs on 1/4" jack connectors, each of which boasts that staggering 120db SNR. Next along is an incredibly handy trio of 1/8" stereo minijack outputs - these can be configured to service a 5.1 surround system. Last but not least is the Ethernet connection port. So, how does it all sound? Truly sublime! The converters are the same as those found in Digidesign's Pro Tools 192 I/O interface - they operate at up to 24bit/192kHz resolution and sound fantastic. The mic preamps are excellent too; there's no audible hiss or noise added to the signal, even when you apply the full 60dB of gain. In terms of software, you get E-MU's renowned DSP Patch-mix software and light versions of Sonar, Cubase, Live, WaveLab and AmpliTube. These all serve to add even more value to an already great package. This is one of the best mobile audio interfaces we've ever seen. It sounds incredibly good and offers so many connections and features that it'd be worthy of a place in most studios, never mind out on the road. Buy one. Now.